Windsor’s Market Cross House is one of our most photographed buildings. The current oak-framed building suffers from a distinct lean. It replaced an earlier building (1592) that was demolished in 1687 to allow for the building of the Guildhall next door However there was a land dispute and eventually the new Market Cross was “rebuilt” in 1718 on or very close to its original location. The original building was rented by a butcher, which makes perfect sense as the area was once the shambles (the meat market) for Windsor. Over the years the building has been used for many purposes. Jewellers, brewers, printers (1931), architects, fruit sellers, coal merchants, florists (1933 and again in the 1960s) and many others have run businesses from Market Cross House. In the late Victorian Era it was known as the Royal Standard beer shop as evidenced by an oil painting on display in the Guildhall next door. Market Cross House sits on the corner of High Street and Queen Charlotte Street, the latter being itself one of Windsor’s attractions; being listed as the shortest street in the country. However, we have not yet addressed the crooked aspect of the building. There seem to be two conflicting suggestions. The general belief is that was built using poorly chosen, unseasoned oak and shortly after construction began to warp into a distinctly crooked appearance that has become it’s defining feature. Another suggestion is that the lean only appeared after adjoining buildings were demolished in the late 1820s. It may also be interesting to note that there is very little of a lean on show in the aforementioned painting of Market Cross House in its guise of The Royal Standard. According to local sources (sorry no verification as yet) somewhere between the 1970s and 1990s hidden steel supports were inserted to ensure future stability of the building. In January 2015 the tea shop that had been in operation on the site closed down. 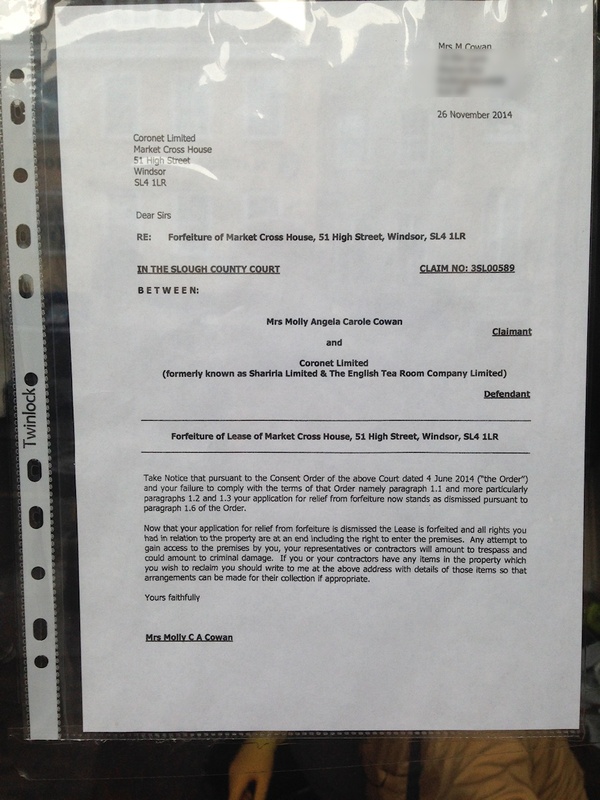 According to the Royal Borough Observer newspaper, the Freeholder (Mrs Molly Cowan) posted a notice in the window stating that the Leaseholder (Coronet Ltd) had forfeited the lease. 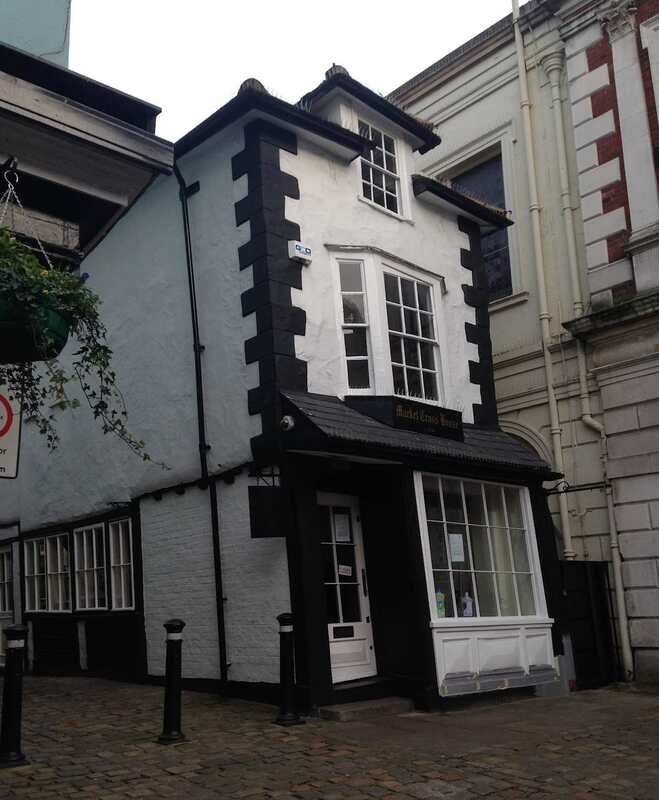 Mrs Cowan used to run an antiques business from the building in the 1980s before leasing it to the tea shop owners. In October 2016 the doors were finally opened to the public once more as Market Cross House changed useage once again. It is now a business selling pearl Jewellery. There are plenty of books and websites that tell stories of a tunnel which runs from the basement of the Crooked House into Windsor Castle and was used by Charles II and Nell Gwynn for secret trysts.